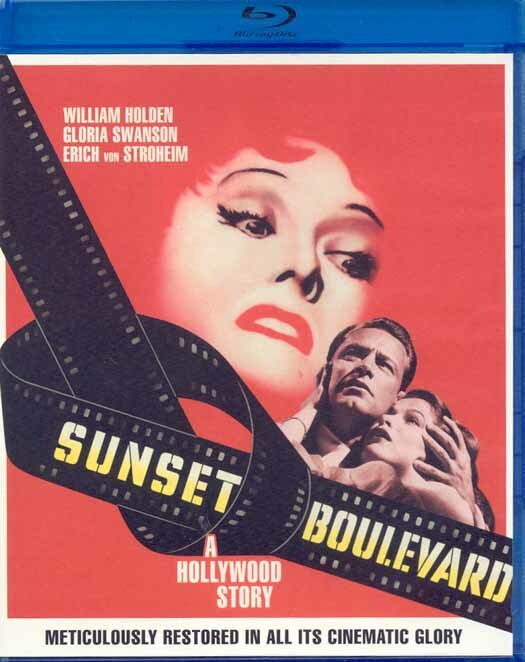 This is topic Sunset Boulevard Blu Ray Review in forum General Yak at 8mm Forum. Just released , the iconic Oscar winning 1950 noir movie about a faded Hollywood movie star. With an unforgettable performance by Gloria Swanson as Norma Desmond, and also starring William Holden as a down-on-his-luck screenwriter , who is enlisted by Norma to architect her triumphant return to the screen. With cameo appearances, all as themselves, by the great Cecil B. De Mille ( his scene was actually filmed on the set of Samson and Delilah), Buster Keaton, Hedda Hopper, and also with Eric Von Stroheim playing her manservant, Sunset Boulevard is a Hollywood classic to be repeatedly enjoyed by all film lovers. The whole film is steeped in nostalgia for the Hollywood of old, and the studio system and great stars that produced all those great films. ‘Without me, there would’nt be any Paramount Pictures” Norma exclaims, as she is driven thru those iconic gates to meet with the great DeMille. Paramount have carried out a meticulous restoration worthy of this magnificent film. The Blu Ray looks flawless, pin sharp throughout with amazing blacks and deep contrast. The Blu Ray comes loaded with over 2 hours of extras, including the making of the film, and a trip around the Paramount lot with ‘Mr. Paramount’ himself, the always classy and immaculately dressed A.C. Lyles, who is like a walking history book for the studio. Quite simply a must have for all film buffs.